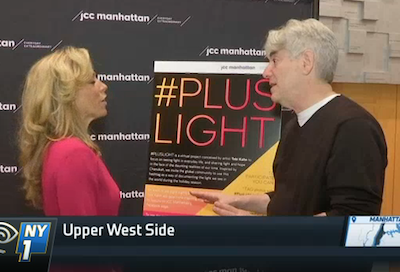 As members of the Jewish faith observe Hanukkah, a New York artist and the Manhattan JCC are adding a modern twist by sharing light with others and inviting others to take part as well. NY1's Stephanie Simon filed the following report. The holidays just got a little bit brighter. To add to the Hanukkah celebration this year, artist Tobi Kahn has created a social media campaign and public art project called #PlusLight. All you have to do is take a picture that captures light and then post it on social media using the hashtag. Continued here.